Hello, nice to meet you, I am Lovely Sara. 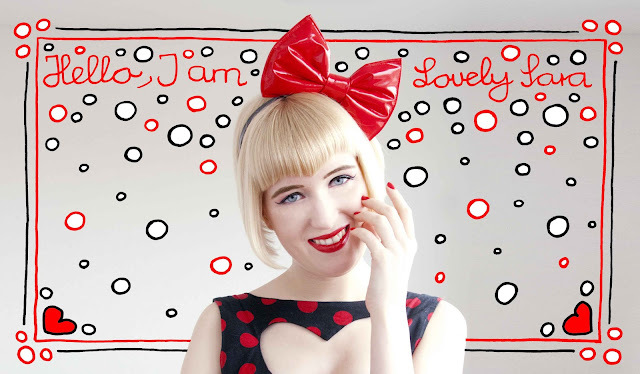 My world is full of hearts, bows and polka dots. I love red lipstick and feel the happiest with a big bow on my head. My heart beats for fashion. I love all the colours, but a vibrant red always makes me dance. I am obsessed with jelly shoes and want to look lovely from head to toe all the time. When I started my blog, the first thing I did was to design a logo. The little comic icon I created includes the most characteristic things of my look: My bob haircut with fringe, a big bow headband and red lips. I added a big heart as a symbol for my never ending love for creative fashion. The icon is me and I am the icon. I think I didn't just create it, but it also shaped me. I began to turn more and more into Lovely Sara. Therefore it's strange, I never showed an outfit post dressed like the Logo-Sara. I am very delighted, I can finally do this and say: Hello, nice to meet you, I am Lovely Sara. I love all the colours of the rainbow and my style is full of many influences from the 50s to Japanese Street Styles to Pop Culture, but this look (you might call it the "Lovely Sara Look") is always a favourite. I feel very well dressed with a big bow and a polka dot dress and I think it's visible on the pictures. The look is a little bit Minnie Mouse inspired with a retro touch. I can't explain, but wearing bows makes me happy. This one in shiny PVC from The Velvet Village especially. Being Lovely Sara feels like what I always wanted to be. It's the result of an uncompleted, but already very long journey. When I was a teenager I didn't know as much is I do now about who I really am. I think most people are not born with their style, but their taste and understanding of style is growing and getting more particularly over the years. Style needs experience. Another thing I learned since I am a teenager is to expect that there is no stereotypic me, but I am made of thousands of facets and can't be put into a box. When I was younger, I always tried to fit myself into a box, because I thought this would tell me where I do belong. Am I a goth, a punk, a vintage vixen? It was a long journey to see, that I am neither. I am a Minnie Mouse today, the next day a colourful circus performer, a pink flamingo girl or an elegant retro lady. Being so many different things doesn't mean to loose myself, like I was afraid at first, but it is who I really am. I think people are not made to fit into a box, but to be a mixture of millions of things, made by their individual story. Like a complex menu with many ingredients and spices to create a unique taste. I don't wear the Lovely Sara Look every day, but I am always Lovely Sara, changing and turning more into my real me. How do you like the "Lovely Sara Look"? 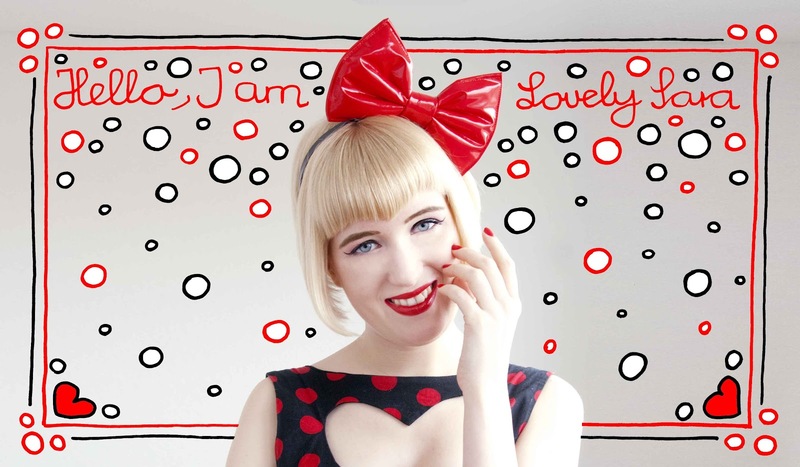 Don't forget to enter my Tatty Devine Give Away. Aww you look so sweet, and definitely YOU :) I love this post, you write so well and I agree with you! This post is amazing as you are. Ohhhh Sara!!!! Always so beatiful!!!!! and with lovely clothes!! i love the dress, the shoes, the petticoat, and everithing!!!!!! but i must say that this one is my favorite! color red in you looks fantactic!!!! Aaah!!! Ich bin total aus dem Häuschen!!! Du siehst einfach unglaublich aus! Das Kleid... die Schuhe... der Ballon!!! Wundervoll!!! Ich finde dich und deinen Look großartig! Du bist einzigartig und hast auf jeden Fall einen gewissen Wiedererkennungswert. sehr coole post und lustig schöne bilder ... tolles rot-schwarzes outfit. herzigrotgut. Du hast echt einen tollen ausgefallenen und kreativen Style. So etwas habe ich noch nie gesehen und dabei so bonbonbunt!